Capmark, whose offices are located in Horsham, has donated yet another hefty batch of used eyeglasses to the Horsham Lions Club. Join us in thanking Capmark for another job well done! Pictured are Lynn Barrett (left) and Marie Guilardi (right). 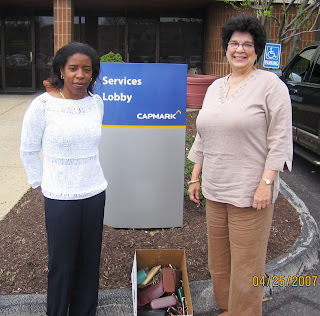 Capmark, formerly GMAC Mortgage, has donated eyeglasses to the Horsham Lions several times over the past several years, and we thank them for their continued support. These eyeglasses will be cleaned, repaired, and will go to those in need of glasses in developing countries. And why is Capmark alone in this effort? Come on, Horsham businesses, join in! Everyone has a few used eyeglasses laying around, start a collection program at your workplace and then contact the Horsham Lions to put them to good use!